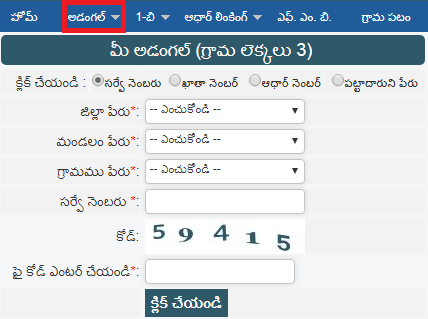 Meebhoomi.ap.gov.in website provides Andhra Pradesh AP Land Records Detailed information on Adangals, Encumbrance Certificate, Tippan, Pahani, ROR – 1B, Village 1B, Field Measurement Book (FMB) etc…. Almost every governmental department in India is digitizing their services so that they can effectively meet the needs of the people. Andhra Pradesh State has also not been left behind when it comes to digitizing their services as evident in meebhoomi.ap.gov.in website. This is a website that is specifically designed to assist the people of Andhra Pradesh in learning every detail about their land. Subscribers of this website will be given any information they need to know about their land by simply accessing the site. This is an achievement by Andhra Pradesh State as it showcases how they care about the needs of all people. All the land details that a land owner needs to know can be found in this website. Revenue cases settlement through the Online Revenue Court Management System found in this website. Disputes related to your land can also be made on Meebhoomi.ap.gov.in website. All the details related to a person’s land are also available. Checking your AP Adangal and AP Village Adangal has been made very easy by just accessing the meebhoomi.ap.gov.in at the comfort of your house. The following procedures carefully give guidance on how to check AP Adangal in meebhoomi website. Using an internet device and an internet connection, access the Andhra Pradesh Mee Bhoomi website using http://meebhoomi.ap.gov.in/ as the link. Once in the website, place the mouse cursor on Adangal tab that is found on the homepage of this website. This will give you two options to choose from i.e. Adangal and village Adangal. Click on “Adangal” when you want to check your Adangal. You will be automatically redirected to a different page on the website from where you are to correctly fill all the details. Fill the details by clicking on the specific option such as survey number, account number and Aadhaar number. For every detail that you fill, click on the ‘click’ tab that is displayed to successfully submit the information. Once completed, you will be able to check your AP Adangal. Check Village Adangal directly from Mee Bhoomi Website by following the steps below. Access Mee Bhoomi website using meebhoomi.ap.gov.in as the link. On the homepage, place the cursor on Adangal option to select it. This action will give you two options i.e. Adangal and village Adangal. Click on ‘Village Adangal’ to check the village Adangal. You will be redirected to a different page from where you are to correctly fill the details. These details include District name, village name and name of the zone. Once you have filled the details click on “click” tab to successfully submit the information. You will then be able to check Village Adangal once the information is successfully submitted. 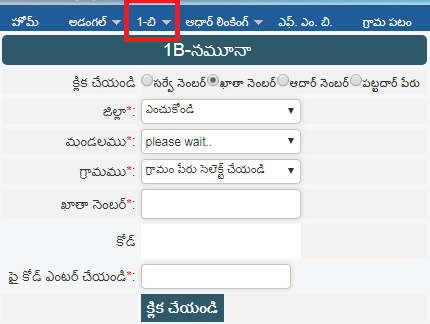 If you wish to check your AP 1-B from Mee Bhoomi website, follow the step by step procedure given below. Place the cursor on 1-B tab from where you will get two options i.e. 1-B and Village 1-b. Click on “1-B’ to check on your 1-B. You will be redirected to a different page on the site. Correctly fill all the details required starting with the district. Once completed click on “Click on” to submit the information and check you 1-B. Using meebhoomi.ap.gov.in, access the Mee Bhoomi website form your browser. Place your mouse cursor on 1-B tab from where you will get two options i.e. 1-B and Village 1-b. Click on “Village 1-b’ to check on your Village 1-B. You will automatically be redirected to a different page on the site. Correctly fill all the details required starting with the district name. Once you are through click on “Click” to submit the information. You will then be allowed to check the Village 1-b. Place the mouse cursor on Aadhar Linking tab from where you will get two options i.e. Aadhar Linking and Aadhar Status. Click on “Aadhar Linking’ to start the Aadhar linking process. Once directed to a different page on the site, correctly fill all the necessary information required. Finally click on “Click” to submit the information and find out whether your account number is attached to your account number. Field Measurement Book is basically a survey of all the land record in a given location. A land owner can be able to check the FMB online without visiting any office. 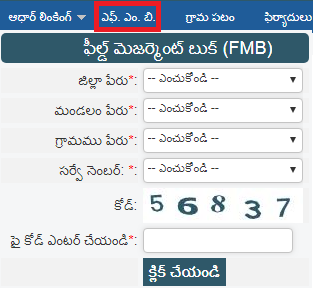 Checking the Field Measurement Book (FMB) can be easily done on the Mee Bhoomi Website by a simple click of a button. Whether or not you have used the Mee Bhoomi Website before, you can check the FMB by following the process explained below. Click on the “F.M.B” tab that is displayed at the top of the site’s homepage. You will be redirected to a different page on the site from where you are required to fill all the details correctly. Once you have filled all the information, click on “Click” tab to submit the information. You will then be able to check the Field Measurement Book. Many land owners have a number of complaints that need to be dealt with before they become fully satisfied. Mee Bhoomi website makes it possible for a person to easily raise a complaint without having to visit any office. 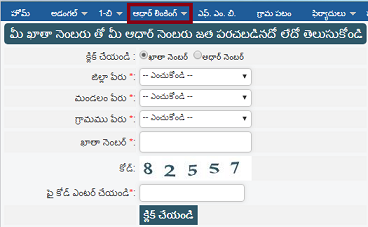 The guideline below shows how you can register a complaint in meeeboomi.ap.gov.in website. On the homepage, place your cursor on ‘Complaints’ tab. You will see two options to choose from. Click on ‘Registration of complaints’ to register the complaint. From the new page, correctly fill in all the details as required by the website. Click on “click” to submit the details once you are through. You will then have registered a complaint on the meebhoomi website.